Disclaimer: when dealing with names that are Japanese, I keep to the Japanese nomenclature, so I present surnames followed by the given name. To summarise the plot, My Hero Academia follows 15-year-old Midoriya Izuku, a boy living in a world characterised by the prevalence of special characteristics or "Quirks" in the majority of the population. These have led to the development of a superhuman society where superheroes have ceased to be the subject of fiction and an actual, living concept within the series. Izuku has the misfortune of being born Quirkless; however, his adoration of All Might, the number one hero pays massive dividends when the hero reveals that his own Quirk can be passed on and that he wishes for Izuku to become his successor. Bakugou Katsuki's name, like many of the other names in My Hero Academia, is a play on words - and a pretty good one at that. For those who aren't familiar with Bakugou, he is a hot-headed teenager with definitely no inside-voice, a high level of self-confidence, pride, rage, and an equally high desire to reach his goals. He cannot stand Izuku's unyielding desire to become a hero despite being Quirkless at first and has bullied Izuku throughout their lives. 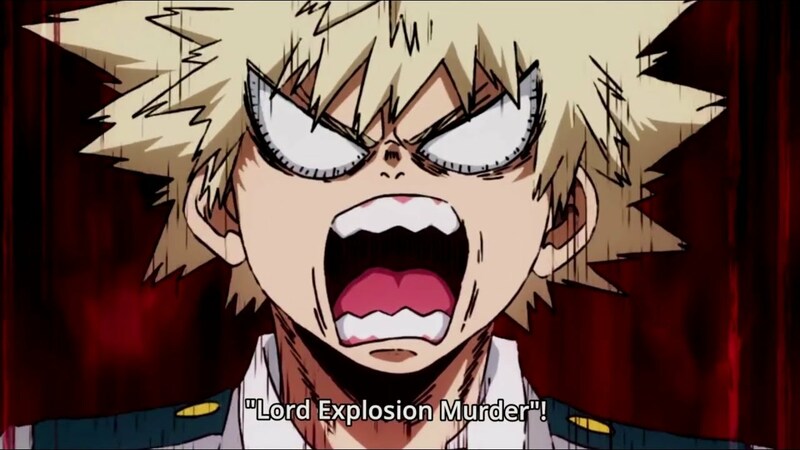 Bakugou's Quirk is called "Explosion", which is pretty self-explanatory - he can create explosions using his hands. Here's where Horikoshi Kouhei threw in the banter - "Bakugou Katsuki" is written "爆豪勝己", where the family name is "Bakugou", written "爆豪", which translates to "bomb". The initial character "爆" - pronounced "baku" is also used in the word "bakuhatsu" - "爆発”, which means "explosion". As for his first name "Katsuki", in Japanese it is written "勝己", which is written with the characters for "win" and a form "self". Due to the fact that Japanese borrows its kanji from Chinese writing, there are often multiple readings and pronunciations for individual characters, so normally this pair of characters can be read "Katsumi". These would be directly translated together to mean something like "win, one's self", but with the reading that we actually have, we're given "Katsuki", the name of a hotheaded character who wants nothing more than to become the number one hero - to win. Altogether, "Bakugou Katsuki" is an incredibly fitting name for the character when we consider his personality, his powers, as well as his ambitions.